Note: The maximum recommended load for this product is 20 pounds. 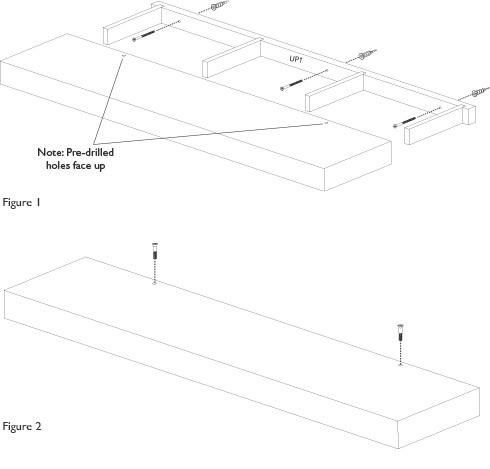 If you are mounting this shelf to a surface other than drywall, or if you are uncertain about assembly, please contact a professional for help with installation. Place the mounting bracket against your wall at the desired location. Use a level to ensure accurate placement. Ensure the mounting bracket is oriented in correspondence with the "up" arrow. Use a pencil to mark the location of each of the mounting holes. It is recommended that at least one of the holes be centered over a stud. Remove the mounting bracket from the wall and use a #2 Phillips screwdriver to install the wall anchors. (Figure 1) Ensure that the wall anchors are flush to the wall after installation. Note: It is not necessary to use a wall anchor for mounting holes positioned over studs. Instead, use a drill to pre-drill a 3/16" pilot hole and continue to step 3. Reposition the mounting bracket and align the mounting holes with the anchors. Use the mounting screws to fasten the mounting bracket to the wall.